With a 66-56 win against Muhlenberg last Thursday, and a 61-50 victory over Widener on Monday, the women’s basketball team has now extended their winning streak to five games, and continue their undefeated path. The ten-point victory over Muhlenberg ended a seven-year, 12-game losing streak against the Mules, while the 11-point win over Widener marked the best start to the season the program has seen since 2001. The Garnet played their best so far this season during the first half of the Muhlenberg game, leaping out to a 13-0 lead and remaining the frontrunners for the entire game. Perimeter shooting – which the team has been struggling with – was not an issue, as the team shot 50 percent from the field. In the win against Widener four days later, they put up some equally impressive statistics, with Lytle and forward Elle Larsen ’15 registering double-doubles. Polli ended on another high note, with 16 points – 12 of which from three-pointers – and three steals, while Ross added eight points, four assists, and two blocks. With two victories over two formidable opponents, the team is aware of many schools’ surprise at their success. “Everyone underestimates Swarthmore athletics because we historically haven’t had the strongest athletic programs,” Polli said. With their next conference game tonight against Washington College, the team is looking to to extend their record to 6-0. The win won’t come easily; “they have two of the biggest players in the game,” said DeVarney. Specifically, DeVarney is looking to continue working on her team’s perimeter shooting; despite putting up stellar numbers during the first half of the Muhlenberg game, the team struggled significantly during the second half, and their field goal percentage slipped to 21.1 percent. However, Polli has faith that the team’s shooting will begin to pick up. “We have a lot of really good three-point shooters…I am confident that our other shooters will get in rhythm soon,” she said. 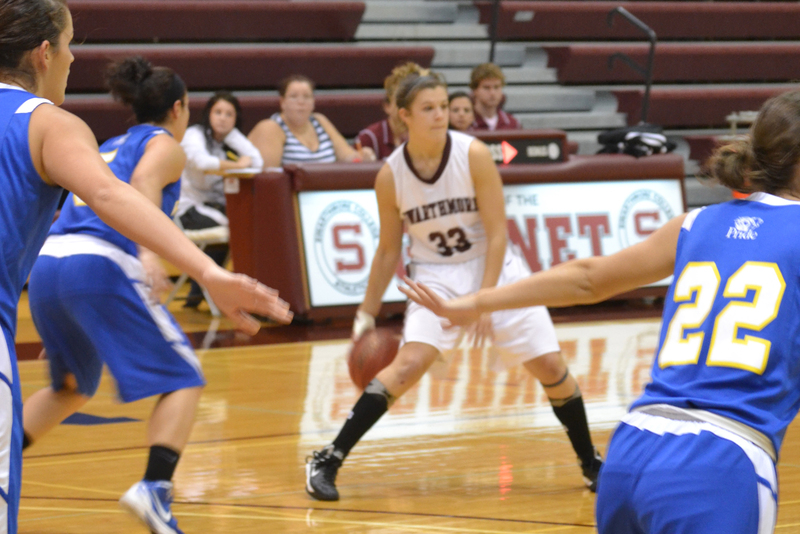 Tip-off against the Shorewomen is set to start at 7 p.m. in Tarble Pavillion.